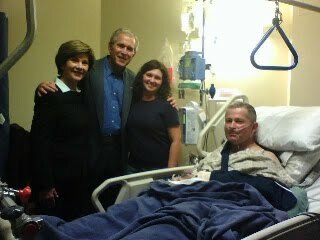 Former president and first lady George and Laura Bush pose for a picture with a soldier wounded in the Fort Hood attack. Since Bush did not bring any media along I assume that this picture was taken at the request of, and possibly using the camera of, the wounded soldier or his family. This act (not the picture) is what caused HillBuzz's remarkable transformation.